Exploration in the Williston Basin started with the discovery of gas in the Upper Cretaceous Eagle Sandstone on the Cedar Creek Anticline in southeastern Montana in the earliest 1900's. 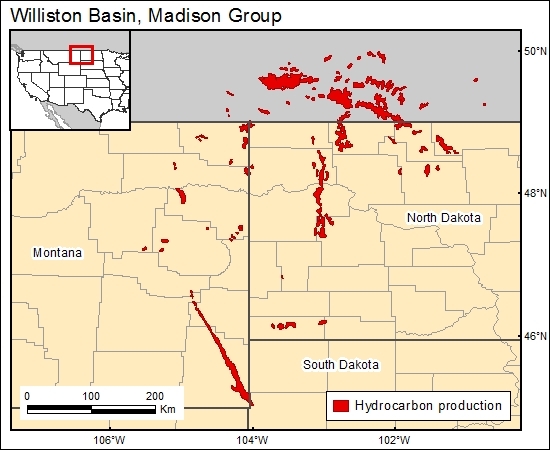 Hydrocarbons have been produced from reservoirs of Cambrian, Ordovician (Red River), Silurian, Devonian (Pre-Bakken-Post-Prairie Salt, Pre-Prairie Middle Devonian and Silurian, Mississipian (Madison), Pennsylvanian, and Triassic ages. Unconventional continuous-type plays are also important in the Williston Basin. Geological Atlas of the Rocky Mountain Region. Rocky Mountain Association of Geologists. Denver Colorado 1972.